“plan”: having a plan doesn’t mean it’s going to work. So, another sentence utterly devoid of meaning used like a shield to deflect the probing halberds of the investing world. What befuddled me even as a child (indeed! – and make no mistake, many children nowadays, though they may lack the words, feel rather queasy about their future), was that every year the budget went up and debt went up and every year someone with utter conviction would declare that “sometime next year” though they were considering beginning to pay it all back. What was incredible forty or fifty years ago now has turned into an outright farce. 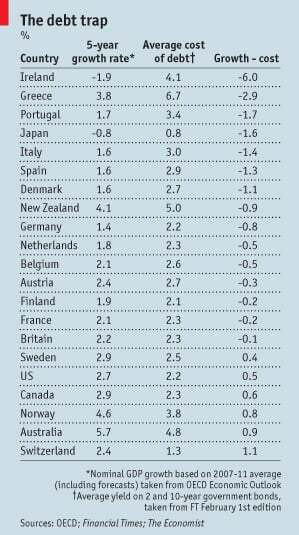 … and we’re again seeing deterioration, also with big countries (wasn’t able to find a more comprehensive table yet). 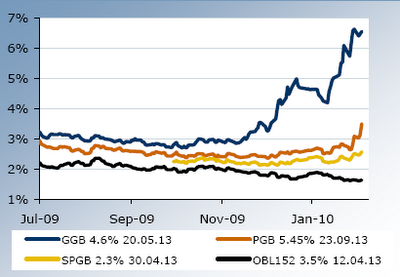 Pragmatic Capitalist: IS THE CDS MARKET SENDING A WARNING SHOT AGAIN? 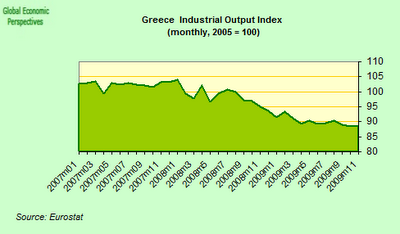 Greece (many ships, many plans): Industrial Output Index constantly falling, deficit rising, their total deficit still understated. There’s a plan to “improve competitiveness through structural reforms and provide reliable statistics” – and not before time! “Today the question is, will Greece be bailed out by the rest of the countries? The officials of the weaker countries tend to emphasize the solidarity of the union, while the stronger countries make it clear that there will be no bailout. Yet, the whole debate is misleading: Greece is already being bailed out by the rest of the union. The European Central Bank (ECB) accepts Greek government bonds as collateral for their lending operations. European banks may buy Greek government bonds (now paying a premium in comparison to German bonds of more than 3%) and use these bonds to get a loan from the ECB at 1% interest — a highly profitable deal. The banks buy the Greek bonds because they know that the ECB will accept these bonds as collateral for new loans. As the interest rate paid to the ECB is lower than the interest received from Greece, there is a demand for these Greek bonds. Without the acceptance of Greek bonds by the ECB as collateral for its loans, Greece would have to pay much higher interest rates than it does now. Greece is, therefore, already being bailed out. 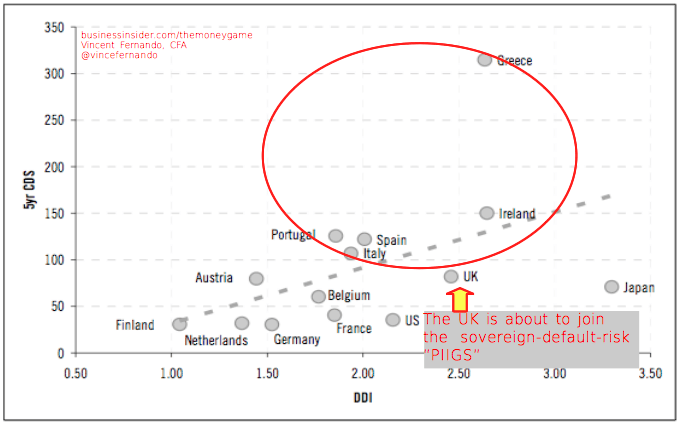 The other countries of the eurozone pay the bill. New euros are, effectively, created by the ECB accepting Greek government bonds as collateral. Greek debts are monetized, and the Greek government spends the money it receives from the bonds to secure support among its population. Prices start to rise in Greece, and the money flows to other countries, bidding up prices throughout the eurozone.” (Emphasis CrisisMaven) And there’s more: now consider, the ECB in theory only accepts AAA rated bonds. Imagine Greece looses its AAA rating (it should have lost it years ago but who listens to people who understand money nowadays – get a rocket scientist, he knows all about bonuses banking) … all these loans have to be canceled and we have the next crisis withn the crisis! Ireland (holed ship): “… Ireland is running an unbelievable 1267% [GDP to debt ratio] …” or, in other words, Ireland’s debt is completely irredeemable. Where these rating agencies get their wisdom from is utterly inconceivable. China (not all ship-shape, “the mother of all black swans“): “The idea that massive levels of reserves are a guarantor of economic stability is, in other words, based on a profound misunderstanding both of history and of the nature of reserves.” “‘Dubai times 1,000 — or worse,’ [Chanos] frets. He even suspects that Beijing is cooking its books, faking, among other things, its eye-popping growth rates of more than 8 percent. 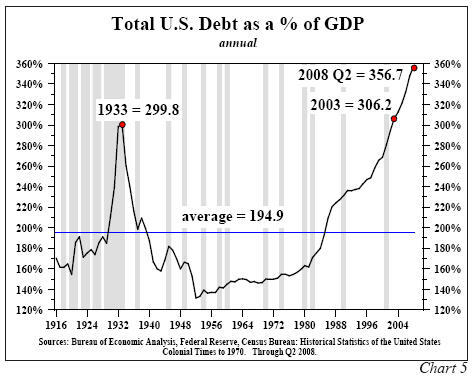 ‘Bubbles are best identified by credit excesses, not valuation excesses,’ he said in a recent appearance on CNBC. ‘And there’s no bigger credit excess than in China.’” Coincidentally that is along similar lines as CrisisMaven has argued since over twenty years when the Soviet union collapsed – the central planning and inefficient socialist economy is by and large similar, but China is a Soviet union without natural resources to speak of when comparing per capita natural wealth of Russia and of China! The numbers show a program that failed to deliver. About 116,000 homeowners have had their loans modified to reduce their monthly payments, the Treasury Department said Wednesday. Only about $15 million in incentive money has been paid to more than 100 participating mortgage companies. That’s 0.02 percent of the $75 billion available. … To implement the program, it took months to hire and train thousands of new workers — many of whom had no previous experience in the mortgage industry. The economy also worsened. Unemployment soared to 10 percent, and home prices continued to fall, especially in Arizona, California, Florida and Nevada. Nearly 16 million homeowners nationwide now owe more to the bank than their properties are worth, according to Moody’s Economy.com. hundreds of thousands of foreclosed homes will hit the market this year, depressing prices even more. “Realistically, we still have massive problems. When exactly are we going to deal with it?” said Christopher Thornberg, a Los Angeles economist who long warned that the housing bubble would burst. … An increasing number of people are opting to walk away from mortgages because they owe more on their mortgages than their homes are currently worth. That could cause home prices, which stabilized last year, to sink again. _1 million people have entered the modification program, and almost 12 percent, or 116,000, have completed the process. _A third of homeowners who made the three monthly trial payments on time have now fallen behind. _More than 61,000 homeowners have dropped out, and hundreds of thousands more are expected to do so in the coming months. _About 220,000 homeowners whose homes have plummeted in value have refinanced. Faced with poor results last summer, the Obama administration pressured mortgage companies [didn’t that initially lead to the crisis???]. … The industry was given strict orders: Sign up at least 500,000 borrowers by Nov. 1. To meet that goal, most companies allowed homeowners to enroll in the program without proof of income [didn’t that initially lead to the crisis???]. That was the same low standard that lenders used when they made some of the riskiest loans that fueled the housing frenzy. … Many don’t comply, despite repeated phone calls, mailings and even in-person visits by notaries. Pensions are unfunded to the tune of 3.2 trillion US dollars while outrageous payments are made. Social Security & Medicare Crisis: Medicare & Medicaid are underfunded by a staggering 54 (fifty-four) trillion US dollars! And make no mistake, that’s never again going to change until the final curtain: “Federal Spending Has Increased Steadily Regardless of Congressional Leadership“. Because … legally you can’t turn the clock back: “Mandatory Spending Has Increased Five Times Faster Than Discretionary Spending“. 1 (1.25 x state and local government employees + Medicaid recipients)/private sector employment. The Heritage Foundation: Federal Budget Deficits Will Reach Levels Never Seen Before in the U.S.
And these bonds may eventually fall like a stone: (Bloomberg) Michael Patterson and Cordell Eddings: “Taleb Says ‘Every Human’ Should Short U.S. Treasuries” Feb. 4 , video here: “Session Video Recording. Investments: Where is the Money in 2010 – What are the Risks?“. Monetary inflation never before known in human history (and maybe the galaxy). … and don’t mention the war! Subsidies for unsustainable and unnecessary, no, in some cases outright harmful projects. 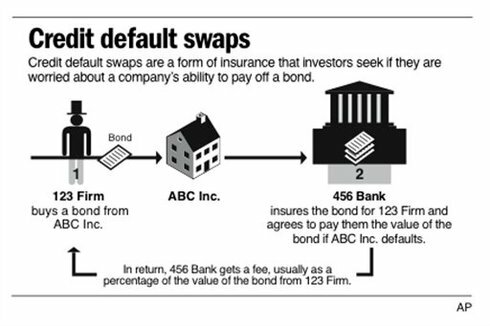 … and for good measure: almost one fifth of the states of the Union are in danger of defaulting (of course, there’s one surefire recipe: spend even more). “Sovereign default: coming to a sovereign near you? The massive build-up of sovereign debt as a result of the financial crisis and especially as a result of the severe contraction that followed the crisis, makes it all but inevitable that the final chapter of the crisis and its aftermath will involve sovereign default, perhaps dressed up as sovereign debt restructuring or even debt deferral. The Dubai World and Nakheel debt standstill and possible default is of systemic significance only because it may well be a harbinger of future sovereign financial distress, in Dubai and elsewhere. And you might also want to check out MoneyAndMarkets – Martin D. Weiss, Ph.D.: “Transcript: Nine Shocking New Predictions for 2010-2012“, 2010-03-01! … So, to sum it up: those oafs with their cunning plans – they have about as much control over their ships as a madman in a rowing boat with no oars approaching a maelstrom … in fact, they’re already heading for the next one. Good content, but those snap things popping up all the time are irritating. Many of them helpfully show a small version of the very graphic you are looking at – obscuring the valuable graphic with a smaller, fuzzy version of the same thing. Get rid of the Snaps. All of them. The use of CDS for such an analysis is questionable. You can’t buy an insurance for the house of your neighbour, but paradoxically you can buy CDS even if you don’t have any economic relation with a certain country (didn’t buy their bonds etc.). This fact, that you can buy insurance for something you don’t own, strongly manipulates the prices of CDS’ and becomes a welcome ground for the speculators. Any analysis on this field thus goes the same way as LTCM did: it ignores the reality and the irrationality behind the CDS pricing and promotes the result based on the bets of speculators as a true assesment of the underlying assets. The prices of the CDS become representative only if they can be bought by market participants who own the assets to be insured and in the respective amount. Otherwise you work with strongly biased speculative data, which, however, might have an impact on the real markets as an self-fulfilling prophecy. But this would be a different story, as the one of George Soros’ bet agains GBP. Tanks for this brilliant post, Chris Maven. I am impressed. In Denmark, for the past 60 years people feel rich if they own just 10% of their homes. Saving was more and more considered foolish, making debt was the right thing to do. And rightly so. He who bought a house at, say 200.000 DKR in 1960 could sell it at, say 2 mio in 2000. House prices went up and up – until 2008 – and then plummeted In the meantime people financed their cars, travels and what else makes life pleasant through mortgaging their houses, knowing that inflation would go on and on, and that more and more money would be printed, making savings at a petty interest rate, which is even being taxed by up to 68%, sheer loss. Then came this damned crisis – and all of a sudden we are being begged to save again – although exactly more spending is needed. Many home owners are now defaulting, their houses only being, say 80% worth their purchase price, which of course, precludes further mortgaging. Was this consumption boom on loan somehow masterminded to destroy our societies? Excellent and supremely detailed article. This is absolutely mind-boggling. I just can’t seem to wrap my head around the way the financial system works and I’m guessing many share my failing. There seems to be a relentless drive towards increasing complexity in order to by-pass common sense, also known as risk management, and satisfy greed. Do these numbers truly even exist in reality? Perhaps it’s time to rewind and go back to basics, where people actually understand how it all works and 1+1=2. Then again, at that point, we’ll just want to make it more sophisticated. Thanks for sharing the link on parallel reality! In my whole career as a consultant I have NEVER found a use for anything but the rule of three and normal arithmetics in economic calculations. There’s an argument for Bayesian forecasting in some areas IF the data are good enough, but that’s it. Those rocket scientists hadn’t a clue, and what’s most striking: send them to a so-called pure mathematican and he’ll collaps laughing at the way they abuse these formulas without understanding them. If only they were liable with their own money, they’d go back to commonsense and the abacus. as neither the crew nor the engines know that manoeuvre. So, for the time being the “open sea” is all we can hope for. I’ve never been interested in Economics (not more then neccessary to do business). But when I started to wonder about the upcoming crises in 2007 and did some research I found out that all there little tings in the world you are all days wondering about are connected and all are going to form a big explosion in the near or middle future. It was not your goal to go that deep but just to complete the scenario: Even all facts and the “big picture” you’re offering point to a deeper problem, a “reason”: The construction and definition of our money nowadays. I am NOT a gold bug, I am not going to tell you that we under all circumstances must return to a gold standard but what we need (definitely) is a new money definition that is not based on credit and dept but value und savings. That’s IMHO the deepest level of “what’s going wrong in the world”. Your English is good enough, even US-Americans and the British don’t understand each other well, being “two nations divided by a common language”. They even argue about how many zeros a billion should have 🙂 Yes, the fiat money regime and the believe that the state can “create wealth” by first confiscating it in one place then squandering it in another are much at the root of the whole problem. And thank you very much for the commendation. A very good post here which summarizes where the world is right now. The more I think about it, the more I’m starting to believe that securing one’s own food supply is pretty important right now as well as lessening one’s reliance on paper currency. Well, you certainly have a point (and I’m not even finished with “the world” yet in that article). But if Roosevelt’s gold confiscation is any guide, then no one knows what confiscations and tribulations lie ahead which is why I recommend to esp. buttress the only fort they can’t invade (yet): the one between one’s ears. When you look back in history, humankind normally, unless a civilisation died completely, q.v. Eypt, Rome etc. (and I hope we’re not yet at that point, though Rome died for lesser financial reasons) didn’t go back to its economic stage before the cataclysm but tried to restore its former level of division of labour. E.g. when Dresden was bombed back “to the middle ages”, they didn’t on day two revert to the horse and cart, but began rebuilding the tramway (or streetcar) lines etc. Nowadays we’re even light years ahead from where they were, e.g. with the Internet. So my best guess is, if other high-inflation interventionist countries are any guide, where even secondary school teachers work three jobs like taxi driving in the afternoon and “waitressing” in the evening, that one should see that one has skills and knowledge others want to buy or, if it must be, barter. See Argentina after their last crisis and currency collapse (and where people hoarded dollars in banks only to then not being able to withdraw, all for “good” political reasons). Good post Crisismaven. My thoughts are this: We are living in historic times, and the consequences of the Banking Crisis of 2007-2010 will have long-term effects which must be faced by everyone. Another point is this – we are also living at a time when the outgoing establishment of Baby Boomers, who are responsible for 95% of this mess have to leave their positions. This includes policymakers, economists, bankers, teachers, etc., – across all public and private levels. They cannot remain. They have done enough damage. This year, 2010, is a crisis year no doubt, and this will continue into the 2010s as crisis after crisis related to the bubble decade of the 1990s and 2000s spreads its disastrous climate everywhere with geopolitical disasters on the horizon. Generation X – which is about to enter as the new establishment is going to have its hands very full cleaning up after the Boomer disaster, and at the same time be creative enough to offer up new alternatives to get back on track towards economic recovery. This is a well thought-out and illustrated analysis of the chaotic economic situation that some so-called ‘major countries’ are in. I personally learned a lot from it. The populace needs more analysts like you, that is, folks who are well conversant in global financial econometrics and who can offer a truthful panoramic view of our economies. Not the so-called “pundits” who just repeat the same forecasts over and over. Kudos! Well, thanks, coming from you with your erudite blog I feel honoured. I will try and make that Bloom of Doom V: “We have control of the ship, we have a plan” THE source for everyone to look up the dreadful figures, the more charts the better, because a) people never see the figures all inone place nor b) do they understand numbers with many zeros, it has to be graphic (in more than one sense 🙂 ). Just added the Data Visualisation References for the same reason. It looks like you put a lot of time and research into your presentation and I commend you for your effort. I found you on visualeconomics. I wrote and opinion on that site and was disappointed that they did print it. I guess it did not align with their agenda. What a sad commentary that we cannot converse and have respectful debate on a subject as important as the Social Security Situation. Well, reanie, when the system breaks, a lot of people will come to their senses (though, sad to say, seeing the respective reports of the crisis, many will become depressive as long as everything is in limbo). Thanks for this.. Looks like good times are headed our way.. Ok not really.. Welcome, Visitor: here’s what you can do … CrisisMaven’s Blog News 2010-02-05: First 5000 Webpage Views!